Looking back only a few days after the fact, I’ve already come to the conclusion that I witnessed something of a rare and bittersweet moment while catching Vandaveer and Mark Olson at Louisville’s intimate Rudyard Kipling Theater (“The Rud”): the passing of the torch from one generation to the next. I’m not trying to draw parallels between Vandaveer’s Mark Charles Heidinger and Mark Olson where none exist; nor am I suggesting that Mark Olson hasn’t continued to make great music in the fourteen (!) years since he left the Jayhawks at the apex of their popularity. But I surely saw in Vandaveer’s opening set all the marks of artistic ascendancy, clear-headed ambition, and a remarkable, easy professionalism that indicated that Vandaveer is more than ready to stand toe-to-toe with any current folky Americana. For Heidinger and Guerin, time is. Vandaveer plays with a kind of earnest, affable intensity that immediately strikes as being lived-in. With a deft touch, Heidinger’s storytelling can go from a whisper to a wail with a dynamic mastery you won’t see too often. Between the absorbing narratives of the songs themselves, the percussive handclaps and foot-stomps, and the perfectly balanced harmonies of Guerin and Heidinger, the band conveys a richness and depth that can make you completely forget you’re listening to just two people and one acoustic guitar. Maybe the vocal interplay on display is what caught Olson’s ear; maybe this beneficence is by design. He certainly knows how to do it well himself, having been part of the thrilling alt-rock Lennon/McCartney he still enjoys with former Jayhawks bandmate Gary Louris. While not “country” in terms of aesthetic, the two Vandaveer singers’ voices blend so well I can only think of a less self-conscious update on the Gram Parson’s/Emmylou Harris duo. 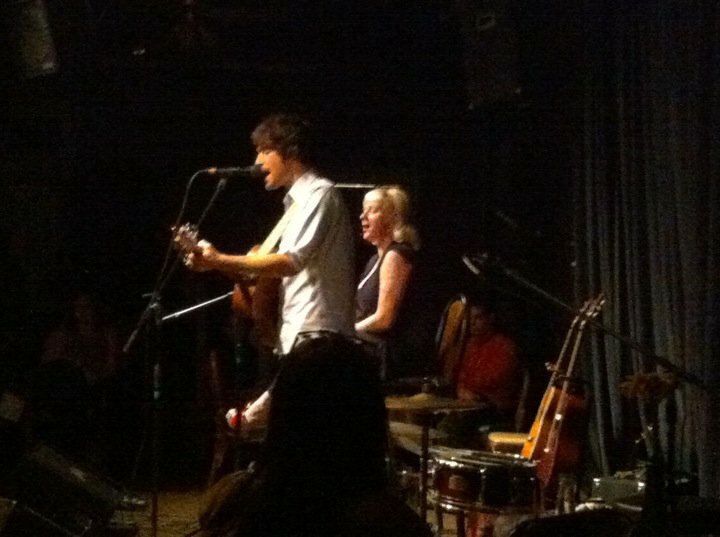 It’s certainly a wise move for all involved for Vandaveer to have been tapped to open for Olson’s solo tour. Both acts may come from slightly different parts of the roots music spectrum, but I can think of no act more worthy to carry on such a tradition than Vandaveer.